The tourist arriving in Apulia must allow the aromas of the ancient dishes of the grand traditions of the area to overwhelm him; dishes that combine the traditions of the countryside with the enchantment of the sea. Olive oil, olives, vegetables and baked products are the mainstays of the local cuisine, a style of Mediterranean cooking based on natural seasonal products joined by the full flavour of spices and herbs like basil, capers and oregano. 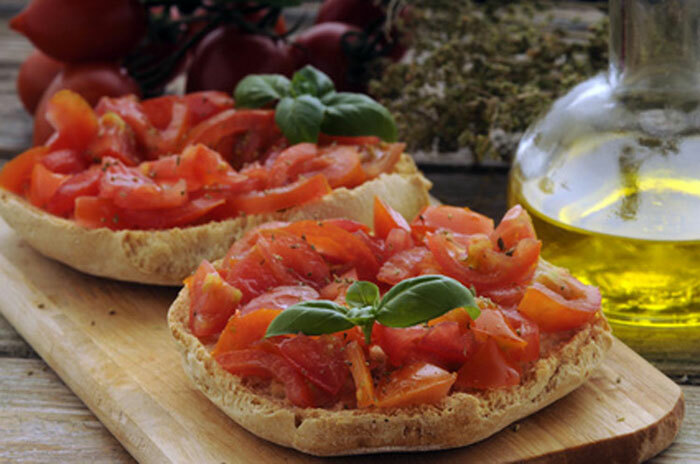 The unquestioned protagonist is extra virgin olive oil, a product capable of enhancing even the simplest of foods, like the celebrated bruschetta, or “frisedda” an oven baked doughnut dressed with oil, salt, pepper, tomato and onion. A cult food in the region is bread in its various traditional forms like “sckuanete” and “muedde”, strictly baked in wood ovens. In the Lecce area typical foods include “pucce” and “uliate”, types of bread with “norchie” olives, not pitted olives, ever. An unforgettable fragrance is that offered by focaccia just pulled out of the oven, dressed with oil and cherry tomatoes, a speciality that is often completed by the addition to the dough of ingredients ranging from vegetables to anchovies, from olives stuffed with meat to salami, or cod, and from onion to tuna. 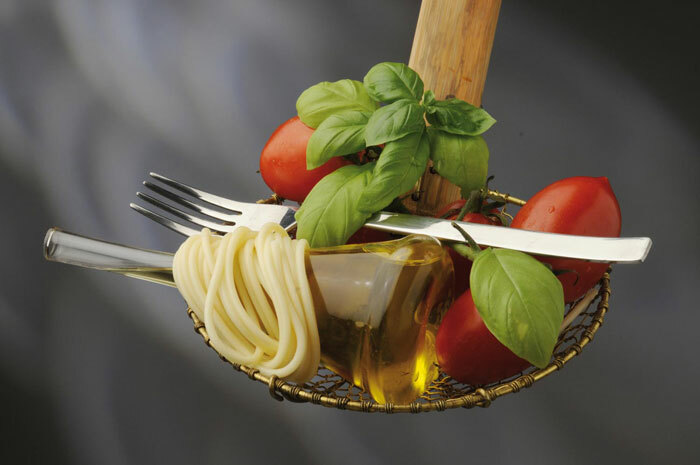 Fresh pasta is queen of the first courses; an all-female tradition, an art handed down from mother to daughter. 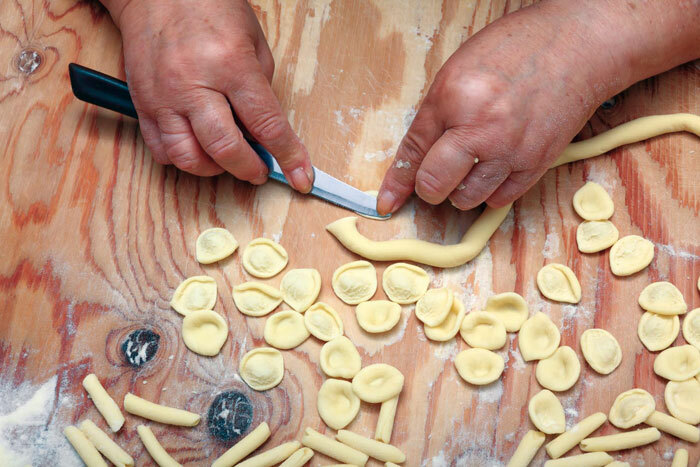 The trick to an ideal result lies in the skill of the fingers: orecchiette, “cavatelli”, “troccoli”, “sagne ncannulate”, “strascenate”, “mignuicchie”, and other types served with ragout sauces made from chops, or with horse meat or beef rolls filled with goats cheese, lard, and parsley, or accompanied with vegetables. 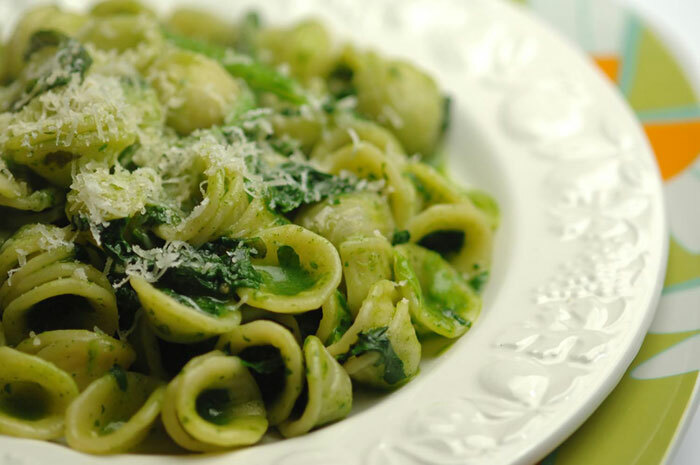 Alongside the well-known dish of “orecchiette con cime di rapa” and anchovies melted in olive oil and garlic, are the tasty pasta with broccoli tips, pasta with cabbage, macaroni with aubergines, pasta with fava bean purée, spaghetti with chicory, pasta with rocket, courgette flowers with pasta and tomato, as well as fava beans and chicory which like other vegetables are often made into conserves to last throughout the year: vegetables in olive oil, in vinegar, olives and sundried tomatoes. 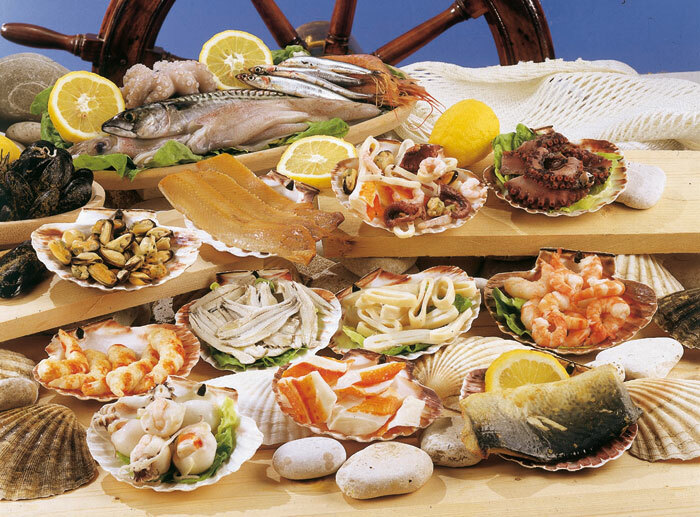 The rich coast offers the addition of fish for every season to Apulian cooking: from Bari octopus “arricciati” to anchovies; from the least prestigious fish which when made into soup become a melody of flavours like the widespread “ciambotto”, to the exquisite seafood. 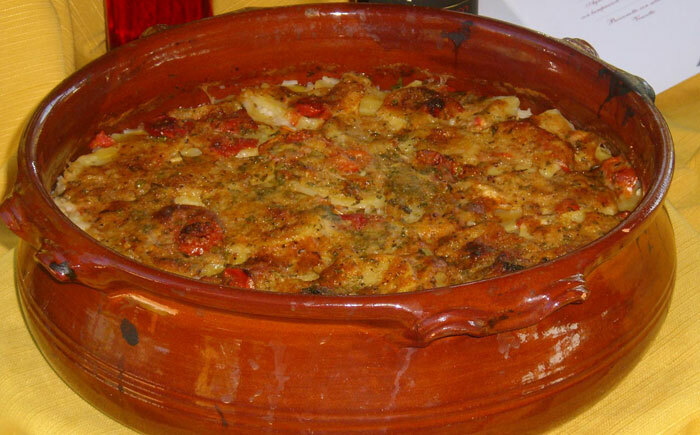 Tubettini with mussels, “impepata” of mussels, “arrancanate” mussels covered with bread crumbs, or the “tiella”, a name that indicates both the container and the soup, that in some ways is similar to Spanish paella, with a covering layer of slices of potatoes over rice, mussels, and other ingredients, cooked in a terracotta dish in the oven; sauces “allo scoglio”, grilled octopus, stuffed cuttlefish, and many other recipes bring the sea to the table in ways to suit every occasion. For those who like their meat, there is also a wealth of choice: “punta di coltello” sausage from the Murgia, “gnumeridd”, lamb’s insides cut into strips and rolled into balls, «quagghiaridde», sheep’s stomach stuffed with offal and scamorza cheese, eggs, and salami, horse meat, and various cold meats are just some of the meat dishes as delicious as the recipes based on eggs and lamb typical of the Easter period. 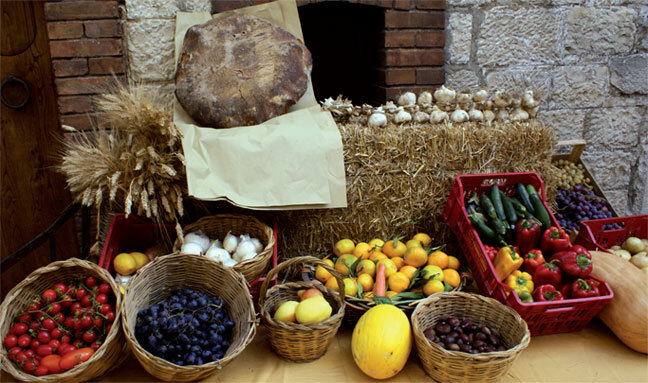 The dairy produce is the feather in the cap of Apulian gastronomy, especially where the fresh cheeses are concerned. Mozzarellas, braids of cheese, bite sized cheeses, and “burrini”, and especially mouth-watering is the “manteca”, a ball shape of fresh “cacio” cheese with a centre of butter. What words are left to describe Apulia’s confectionery delights? They are the result and embodiment of thousands of years of traditions, often made using natural sweeteners like fig vino cotto, or almond paste also used for marzipan creations. Then there are “Cartellate”, seasoned with honey and vino cotto, “Mostaccioli”, “Calzoncelli” filled with fig jam, “Castagnelle” made with Apulian sweet almonds; “atterrate” almonds toasted in the oven and then dipped in boiling chocolate, and “black taralli” made from sugar and vino cotto, as well as “zeppole di San Giuseppe” filled with custard and morello cherries, and then “Scarcedde” and “Scarcelle”. 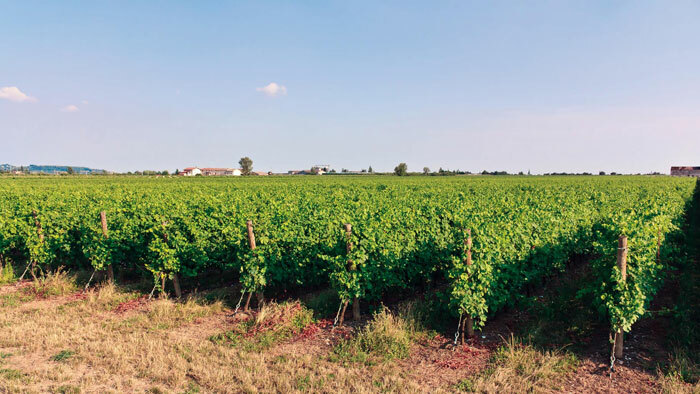 Everything is accompanied by excellent wines; there are many to choose from: “Aleatico di Puglia”, “Nero di Troia”, “Salice Salentino” and “Primitivo di Manduria” are just some of the DOC wines made in Apulia. The food of Apulia is brimful of fragrances, flavours, and emotions.